A New Zealand nurse believed abducted with two drivers by Islamic State militants in Syria in 2013 may still be alive, the International Committee of the Red Cross has revealed for the first time in an appeal for news of her whereabouts. Louisa Akavi was snatched along with Syrian drivers Alaa Rajab and Nabil Bakdounes while travelling in a Red Cross convoy delivering supplies to Idlib, in the northwest of the country. Armed men stopped their convoy on October 13, 2013, and abducted seven people, four of whom were released the following day. The ICRC said it believed they were abducted by the Islamic State group (IS). "Our latest credible information indicates that Louisa was alive in late 2018," the group said Sunday in a statement from Geneva. "The ICRC has never been able to learn more details about Alaa and Nabil, and their fate is not known." New Zealand said it disagreed with making the abduction public but did confirm it had dispatched a special forces unit to Syria to search for Akavi. "This has involved members of the NZDF (New Zealand defence force) drawn from the Special Operations Force, and personnel have visited Syria from time to time as required," New Zealand Deputy Prime Minister Winston Peters said Monday. "This non-combat team was specifically focused on locating Louisa and identifying opportunities to recover her. "The efforts to locate and recover Louisa are ongoing, and there are a number of operational or intelligence matters the government won't be commenting on," he said. New Zealand Prime Minister Jacinda Ardern expressed disappointment at the information released by the ICRC and refused to answer questions at her weekly press conference on Monday. "It absolutely remains the government's view that it would be preferable if this case was not in the public domain," she said. 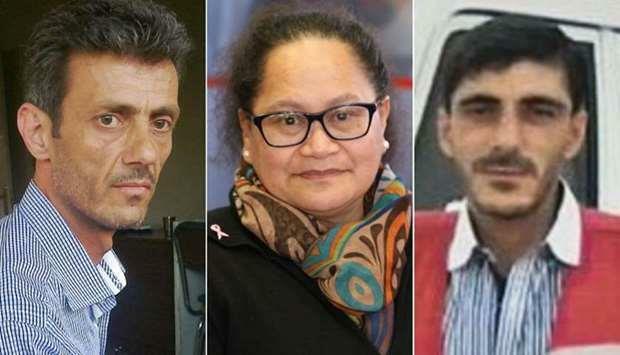 Peters said information about the kidnapping had not been previously released for fear that any publicity would place the hostages at greater risk, and New Zealand media outlets which knew Akavi had been taken hostage agreed not to publish the story. "In these situations the priority must be the safety of the hostage and we received clear advice that any publicity would place Louisa at even greater risk," Peters said. "The government is very grateful for the cooperation of media outlets over many years in respecting this advice and undertaking not to publish ... and we thank them for their principled approach." ICRC operations director Dominik Stillhart said it was an "extremely difficult time" for the families of the three. "Louisa is a true and compassionate humanitarian. Alaa and Nabil were committed colleagues and an integral part of our aid deliveries. "We call on anyone with information to please come forward. If our colleagues are still being held, we call for their immediate and unconditional release." Akavi had carried out 17 field missions with the ICRC and the New Zealand Red Cross, the statement said. Rajab and Bakdounes were "dedicated husbands and caring fathers", it added. A spokesman for Akavi's family, Tuaine Robati, said she knew the dangers she faced. "She's been through tough times in her job before but she's stuck at it because she loves it," he said. "Louisa is an incredibly experienced nurse and aid worker who knew the risks of her job. Our family misses her very much and is concerned for her safety." The war in Syria, which began in 2011, has claimed more than 370,000 lives and forced millions of people to flee their homes. The Kurdish-led SDF, backed by a US-led coalition, captured the last IS bastion in eastern Syria on March 23, and had detained thousands of suspected IS fighters. But this could make it more difficult to find Akavi. The New York Times has reported the Red Cross has reason to believe she is alive, because at least two people described seeing her in December at a clinic in Sousa, one of the final villages to be held by IS jihadists. "We are speaking out today to publicly honour and acknowledge Louisa's, Alaa's, and Nabil's hardship and suffering," the ICRC statement said. The organisation has 98 foreign workers and 580 Syrians working in the country. The Syrian Observatory for Human Rights accuses IS of abducting thousands of people since 2014.